Real Madrid on Tuesday announced the transfer of modern great Cristiano Ronaldo to Italian champions Juventus, with the Portuguese superstar saying the time had come "for a new stage" in his life. Spanish media reports said the move could cost Juventus 105 million euros ($120 million), with Ronaldo signing a four-year contract worth 30 million euros per season. The 33-year-old is expected to have a medical in Turin next week before being unveiled by his new side. "Today Real Madrid want to give thanks to a player who has demonstrated he is the best in the world and who marked one of the most brilliant periods in the history of our club and world football," Real Madrid said in a statement. In a letter posted on the Real website, the five-time Ballon d'Or winner said his time in the Spanish capital, during which he became their record goalscorer, had been one of the happiest in his life. "I only have feelings of huge thanks for this club, for the fans and for this city," he said. "But I think the time has come to open a new stage in my life and that's why I asked the club to accept to transfer me. "I ask everyone, and especially our supporters, to please understand me." Juventus begin their pre-season schedule with a friendly against Bayern Munich on July 25 in Philadelphia, while Ronaldo could make his competitive debut for the club the following month, with Serie A to announce its fixtures for the upcoming season on July 20. "It was very nice to be in Madrid," he said at the time, using the past tense. He later played down the comment, but doubts over his future at Madrid lingered, especially after he had also threatened to leave the previous year. Despite failing to score in the 3-1 win in Kiev which sealed Real's third successive European Cup, Ronaldo finished as the Champions League leading scorer for the sixth consecutive time with 15 goals. Now Juventus will be hoping that he can maintain his ruthlessness in front of goal for a few more years and finally help them end an agonising wait to become European champions for the first time since 1996, despite a prolonged period of domestic success. Massimiliano Allegri's side claimed a seventh straight Serie A title last season by holding off an inspired Napoli, but fell to Real in Europe after a dramatic quarter-final, when Ronaldo ended a thrilling fightback by the Old Lady with a controversial last-gasp penalty. Ronaldo also scored twice in the 2016 final as Real downed Juve 4-1 in Cardiff. It will be the biggest fee ever paid for a player aged over 30, but the Italians are gambling on the hope that Ronaldo can produce similar longevity to their former goalkeeper Gianliugi Buffon, 40, who left for Paris Saint-Germain last week. 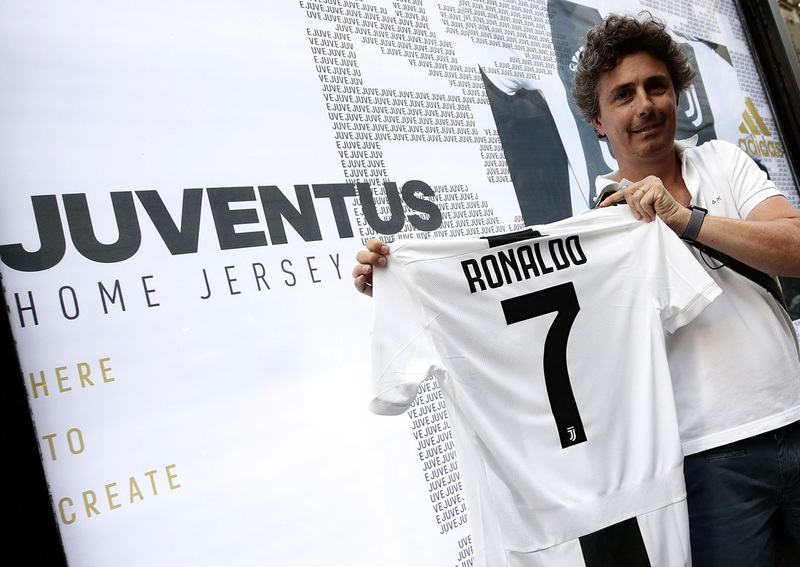 But they are not the only ones with faith in one of the best players of all time, with Juventus' shares on the stock exchange spiking by almost 40 per cent since rumours of Ronaldo's arrival first surfaced on June 28, and by 5.7 per cent on Tuesday alone. Ronaldo won two La Liga titles and four Champions League crowns with Real after joining from Manchester United in 2009 for a then world-record fee of £80 million ($94 million). "They have been nine unique years," added Ronaldo. "It has been an exciting time for me, full of respect but also hard because Real Madrid have high expectations, but I know very well that I will never forget that I have enjoyed football here in a unique way." Serie A will be the third of Europe's four biggest leagues that Ronaldo has graced, and his move shows that none of his drive and ambition have decreased in the latter stages of his career. He will also be hoping to take the lead later this year in his personal race with Barcelona forward Lionel Messi for most Ballon d'Or awards, although fans will now have fewer on-field battles between the two to enjoy.